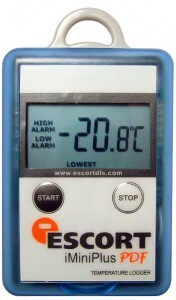 This is a multi-use temperature data logger which generates pdf report automatically. For many applications including transportation, the receiver may not have any special software. In such cases, this data logger is useful. It does not require any special software to generate a report. You can simply connect the data logger into a computer through USB cable. Then this will act as a USB memory disk. You can see this as a USB drive in the File Manager of your Windows PC. Inside this USB drive, you will see the pdf report. The pdf report will show all major details of the recording. You should have pdf reader available on your computer. For programming purpose, you can use our free ConsolePro software. This is a multi-use data logger. So the user can use it any number of times. This multi-use temperature data logger is model no MU-IN-D-16-L. Brief technical details of the same are as below. It has a memory capacity of 16000 readings. This means that if the recording frequency is every 5 minutes, it can record for 54 days. If the data recording interval is 3 minutes, it can record for 33 minutes and so on. The user can change the recording frequency. Sensor type is internal. If you require an external sensor, you may go for our model MU-OE-D-16-L, which has one external sensor. Programming interval is possible between 5 seconds to 18 hours. The temperature measurement range is from -40 to +80°C. Temperature measurement resolution is 0.5°C. The user can start the device by the start button. Alternatively, he can program the same to auto start at a specified time. It has a battery life of more than 1 year, but will mainly depend on the operating conditions. By using the free software, the customer can generate excel and text reports also. The customer can protect the device by a password so that reprogramming is not possible by any unauthorized person. If you require a single use model, please go for our model MU-ST-D-8-L, having an internal sensor. All other features are same as the multi-use model. Click to see the sample pdf report. Click to see the sample Excel report. Click to see detailed technical specification.